Languages do not exist in isolation. They come into contact with each other both in society at large and in the individual speaker, inevitably leaving traces of contact in the process. Convergence, where one or both of the languages of a bilingual change resulting in bilingual varieties that resemble each other more than the respective monolingual varieties, has been suggested as a factor in bilingual production patterns. This thesis furthers our understanding of convergence in bilingual language production by examining diverse patterns of convergence in the semantic domain of motion encoding. 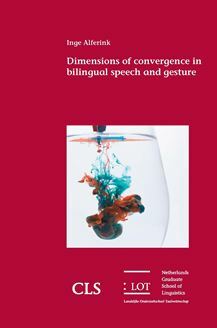 Patterns of convergence are studied at the level of both lexical and distributed semantics as well as cross-modally in speech and gesture.